More than a week ago, I had decided that today’s post would be dedicated to the updated version of the DW12 that will run in 2018. 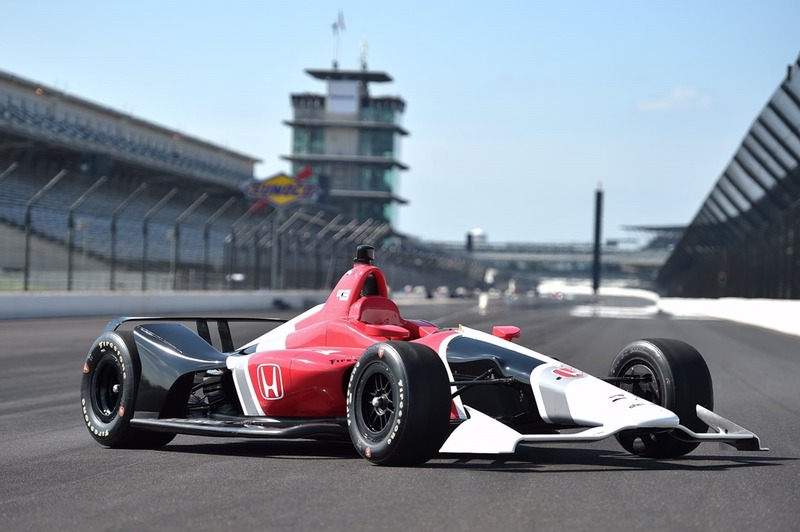 After all, this car is something that has been pointed to by every corner of the Verizon IndyCar Series. Not only are fans looking forward to a car with much improved looks, but drivers, teams and even the engine manufacturers are keeping a close eye on the development of this car. 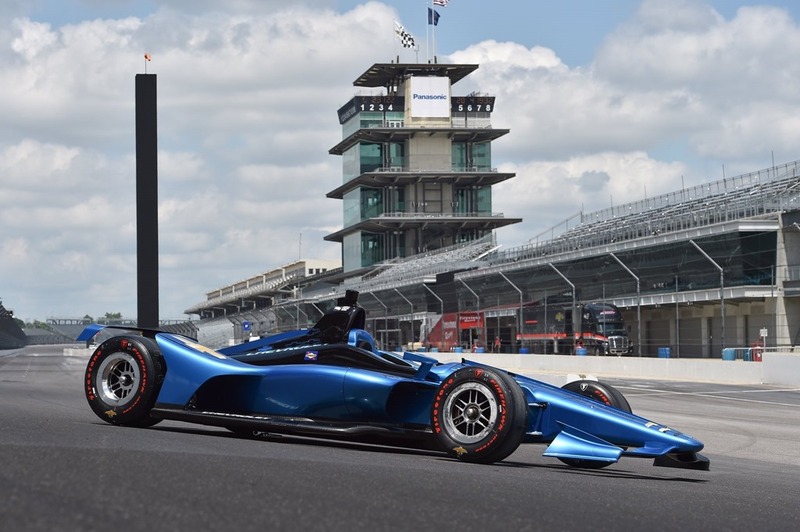 Juan Montoya and Oriol Servia debuted the car on the oval at the Indianapolis Motor Speedway yesterday. There was a point Sunday night where I was wondering if the Brickyard 400 would be completed by yesterday’s IndyCar test, but that’s another story entirely. I was in favor of the aero kits, when the idea first came up in 2011 as the ICONIC committee awarded Dallara with the sole contract to build the new Indy car. I had been a proponent of selecting at least two manufacturers, such as Lola and Swift, to compete against each other on track. The idea of aero kits was floated as a way to have a common tub, but have different companies such as Boeing or Lola design aero kits or various aerodynamic pieces to mount to the car to give it different aerodynamic and handling characteristics. The fact that the cars would have totally different looks was an added bonus. Originally, teams could purchase up to two completely separate aero kits that they would be free to swap around throughout the season. We all know now that the aero kits didn’t quite turn out as planned. Design companies did not knock themselves over for their chance to design an aero kit. It was left to the engine manufacturers to outsource their kits and put their name on them. Neither was beautiful, but the Honda was ugly. Still, I thought even the Honda looked better than the original DW12 that was in use from 2012 through 2014. The bulbous wheel-fairings that extended from the sidepods of the original DW12 are some of the ugliest features I’ve ever seen on any race car. Anything that did away with those unsightly items were an immediate improvement. 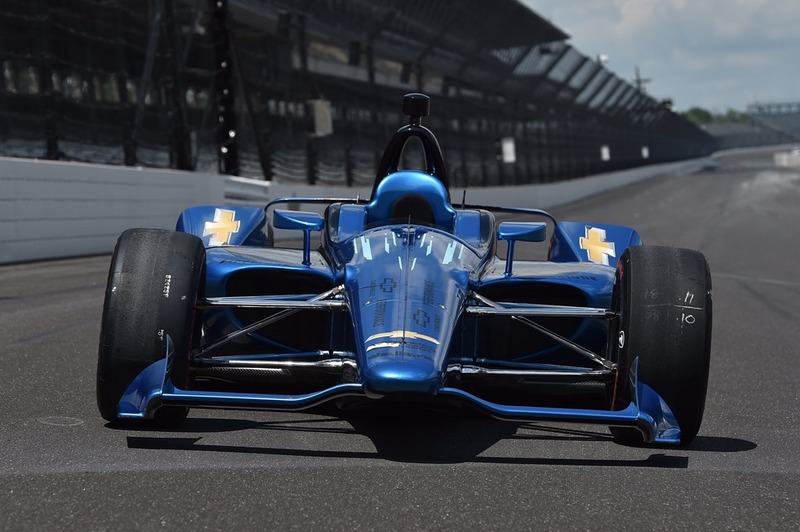 Looks aside, the Chevy aero kit seemed to perform better also, but they did show a tendency to get airborne at the Indianapolis Motor Speedway without much help. This season, Honda has closed the gap to Chevy, or even surpassed Chevy. Regardless of what some thing, the scoreboard is completely even – each manufacturer has won six races with five to go. One theory has it that Honda made changes to their engine to overcome the deficiencies in their aero kit. If that is indeed the case can we expect the Honda engine to dominate next year with the common body kit? I have no idea. I know it’s never that simple, but being the non-engineer that I am, that’s how it comes off to a novice like me. Anyway, regarding yesterday’s debut, there really isn’t much to report. The gearbox on Servia’s Honda went out just after his install lap in Turn two just after he left the pits. Montoya’s car also had its issues – electrical gremlins plagued it all morning. Eventually, both cars got going. Unofficially, I heard that both cars topped out around 217 mph. That’s about what was expected in what was more of a shakedown run than anything. But they apparently accomplished all they wanted to yesterday, so they will not be hitting the track today as had been originally planned. From the photos and videos I saw, the car looked good, but we knew that already. One difference I noticed was the presence of a fairly high ridge that ran the entire spine of the car, that wasn’t shown on any of the renderings previously released. I can’t say it helps the look of the car. In fact, it makes the rear cowling look bulkier than the renderings showed. But if it prevents the car from going airborne, that’s a good thing. I’ve gone off on the ugliness of the airbox enough that it’s probably not necessary to beat that dead horse anymore, so instead of talking about how ugly it was – let me just simply state that the rear cowling on the revised car looks really, really good. It looks sleek and just makes for a really good-looking race car. And thank goodness the rear bumper pods seem to be a thing of the past. It truly looks like an open-wheel car again. Give credit to Jay Frye and his staff for making aesthetics an essential part of this design. I’ve heard people say they don’t care what a car looks like so long as it is racy. I consider that a load of bunk. Part of the many reasons I found the early days of the IRL so hard to follow was the look and sound of the cars. Nothing is as beautiful as watching a good-looking race car gracefully navigating a challenging turn. To me, it’s poetry in motion. That’s one of the things that initially sold me on this sport decades ago. Consequently, there’s nothing more gangly looking than following an ugly race car. Champ Car fans like to compare the 2018 car to their DP-01of a decade ago. I know this will be a sacrilege to them, but I don’t believe that to be the benchmark of beautiful race cars of what I consider the modern era (post-1980). In my book, it’s hard to beat either a 1991 Lola or Penske (PC-20). There may have been better, safer and faster cars; but few that could beat those two cars in looks. But even those cars had cowlings that were not as sleek as the 2018 car. 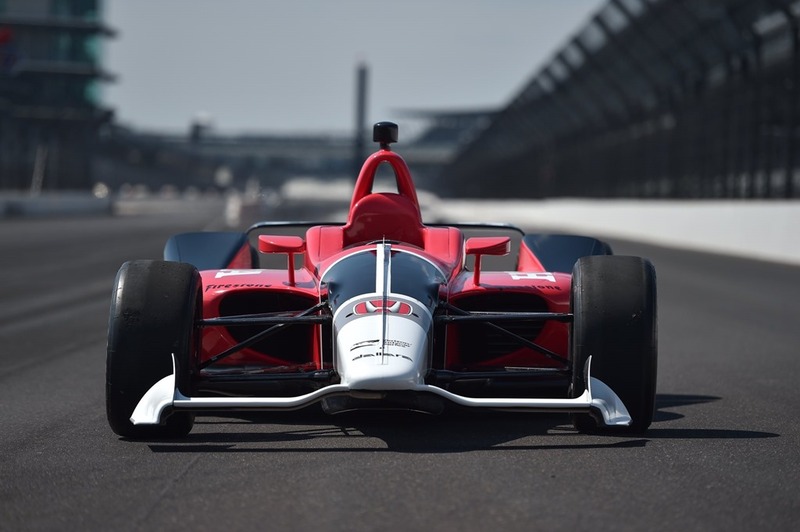 So as more information comes out about yesterday’s test, I’ll be curious to see what information about speeds, driving characteristics and the like might be released; and how the information compares to the old DW12. Not since 1996 have I seen a car race in the Indianapolis 500 without an airbox. Next May and twenty-two years later, I’ll finally get my wish. It’s been a long time coming. This entry was posted on July 26, 2017 at 4:04 am and is filed under IndyCar. You can follow any responses to this entry through the RSS 2.0 feed. You can leave a response, or trackback from your own site. The sleek cowling is even lower than ones on the slippery-when-still 2000 Swift and 2001 Lola. The cowling, and the car in general, actually reminds me of the Swift 014.a Atlantic car. I say that as a positive thing, as I rather liked that car. And speaking of sleek cowlings, Swift’s 014.a follow-up, the 016.a, barely had a cowling. I’m still disappointed to lose aerokit completion, but I will certainly enjoy watching these cars race. I like the looks of it and really like the back “bumpers” being gone. The only thing I really don’t like from a visual standpoint is the back wing. It just looks too simple compared to the rest of the car. But if it does the job I can’t complain. Finally a beautiful car! I hope it races well and makes good racing! Haven’t been this happy since reunification!!!! All Hail Indy!!!! I too liked the aero kit idea even though it made the car so ugly, although ,some of the early IRL cars could sure challenge the top spot and by far, the worst engine sound ever. I enjoyed the constant development and experimentation with the cars with the aero kits. Sometimes the cars would be asymmetrical as teams searched. The massive downforce on road courses and short ovals was impressive. We probably will not see cornering speeds like that again. However, they were absolutely heinous. But now, its so long Kardashians! This car looks really good. Jay Frey was quoted as saying that pictures don’t even do this car justice compared to in person. Can’t wait to see the road course kit. Like George mentioned, the car looks great, sort of a throwback to good old days. However what I want to see Indycar go back to is multiple chassis manufacturers and more Engine companies getting involved. Just saw an article that Ilmor is also talking to F1 about supplying engines and so is cosworth. 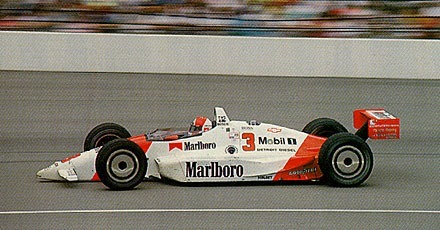 How about Indycar use the same engine spec as F1, perhaps get one or two of the manufacturers to participate in Indy? Much, much better than what we have now. But the wheels are still inside the bodywork. I really, really, really like it. Really! Not that my opinion matters much in the IndyCar world. Servia and Montoya both had very good things to say about the performance of the car and their opinions do matter. The old airbox never bothered me that much but I don’t miss it either. Glad to see the back bumper thingys gone also. I am so happy to experience Jay Frye making IndyCar great again. What a wonderful hire he has turned out to be. So yes, this is a proper looking race car. Sure, not a Novi or Blue Crown Special perhaps, but that old guy I see in my mirror each morning is no longer sleek or imposing either.